RS40-1 61.0 41.5 38 6.0 M8 4.00 15 11.2 13.0 6.5 0.04 Contact us for details. Contact us for details. RS50-1 72.5 48.5 44 7.5 M10 5.12 19 13.8 17.0 8.0 0.07 Contact us for details. Contact us for details. RS60-1 89.1 60.0 55 9.1 M12 5.99 21 17.8 19.0 10.0 0.12 Contact us for details. Contact us for details. RS80-1 117.1 79.0 73 12.1 M16 7.98 28 22.6 24.0 13.0 0.27 Contact us for details. Contact us for details. RS100-1 145.1 98.0 91 15.1 M20 9.58 34 27.5 30.0 16.0 0.51 Contact us for details. Contact us for details. RS120-1 173.1 117.0 108 18.1 M24 11.15 40 35.5 35.5 19.0 0.86 Contact us for details. Contact us for details. 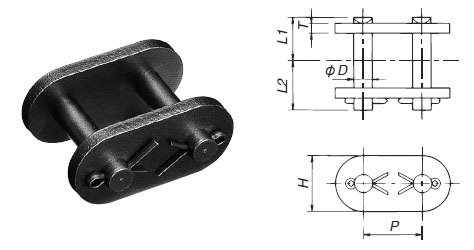 1.The SW dimension was designed to match the width of the two jaws of a wrench. 2.Uses former JIS B1181 (Category 1) for the nuts and JIS B1251 for the spring washers. RS40-1 12.70 12.0 3.97 2.0 8.8 10.2 0.01 Contact us for details. Contact us for details. RS50-1 15.875 15.0 5.09 2.4 10.7 12.3 0.02 Contact us for details. Contact us for details. RS60-1 19.05 18.1 5.96 3.2 14.0 16.1 0.04 Contact us for details. Contact us for details. RS80-1 25.40 24.0 7.94 4.0 17.5 20.1 0.09 Contact us for details. Contact us for details. RS100-1 31.75 28.6 9.54 4.8 21.0 23.7 0.156 Contact us for details. Contact us for details. RS120-1 38.10 34.4 11.11 5.6 26.05 29.55 0.264 Contact us for details. Contact us for details. 1.Use an F-type connecting link if lateral forces are present. 2.Contact a Tsubaki representative regarding connecting links and end links with different shapes.